Whenever we go to a Beijingnese restaurant, we always had Peking duck and Gao Lic Dou Sa 高力豆沙. These golden puff balls are rarely found in Cantonese restaurants. They are probably my favourite of all Chinese desserts. It's deep fried meringue with sweetened red bean paste or dou sa 豆沙. You can use homemade bean paste using this recipe or bought bean paste. There is no sugar added to the meringue, so not so sweet or fattening. Once the meringue is fried it has a lovely eggy nutty taste and slightly crunchy on the skin. Biting into it is a puff of airy meringue with soft, warm and sweet bean paste. Yum yum! Not too difficult to make unless you hate deep frying at home. Recipe as below. This will make about 8 - 10 balls. Allow for 2 - 3 per person. I am a piggy, I can eat up to 4 - 5 easily. If you can get a helper it's easier. One person in charge of making and shaping the meringue balls and other look after the deep frying. If not you can fry one ball at a time. I normally use about 2 cups of oil and follow step 10 below. Take a tbsp of bean paste and shape it to a ball. Make about 10. Dust lightly with a little cornflour and shake off excess. Whisk the egg whites in a clean bowl till stiff. Sift in plain flour and cornflour directly onto the meringue, best if you can fold at the same time so the flour will not settle on the top too much. Fold gently to mix. If the meringue looks a little bit lumpy don't worry. Heat the oil to medium hot, you can test it with a bread cube if it sizzles rapidly and browns very quickly it's too hot. Take a small ladle or large serving spoon, pile on some meringue. Pop a bean paste ball on top. Cover the bean paste ball with more meringue. Smooth the edges slightly to form a ball. The meringue ball is roughly bigger than a large egg. Gently ease this meringue ball into the hot oil. Do not deep fry too many balls at a time, 2 - 3 maximum unless you use a lots of oil and plenty of room for the balls to move around. If you use a deep fat fryer or with plenty of oil in a wok to cover the balls, then the next step (10) is not required. If the frying oil does not cover the whole ball it is better you follow this step. If not when you turn the balls the uncooked/browned meringue will flatten and you won't get the lightest and airy puff balls. This is what you need to do. As soon as a ball is in the hot oil, use a large metal ladle, scoop hot oil and continuously pouring over the ball to cook and brown it. Be gentle at first not to disintegrate the meringue. When the top part of the ball is slightly brown, then turn lightly few times till all sides are light golden brown. Take out and drain on kitchen paper. 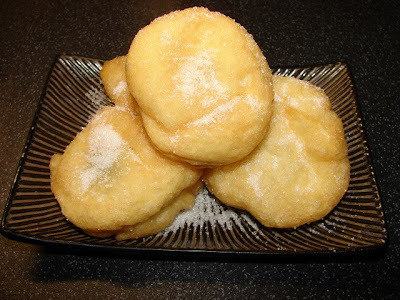 Put puff balls on a serving dish and sprinkle with sugar. If you don't have red bean paste you can use banana, fresh strawberries or a cube of ripe mango. I think chunk of chocolate will also work. Experiment and be brave. Does not have to be authentic Chinese if you don't want to. It's very soft like a puff of air.